My name is Chinedu Ukabam. 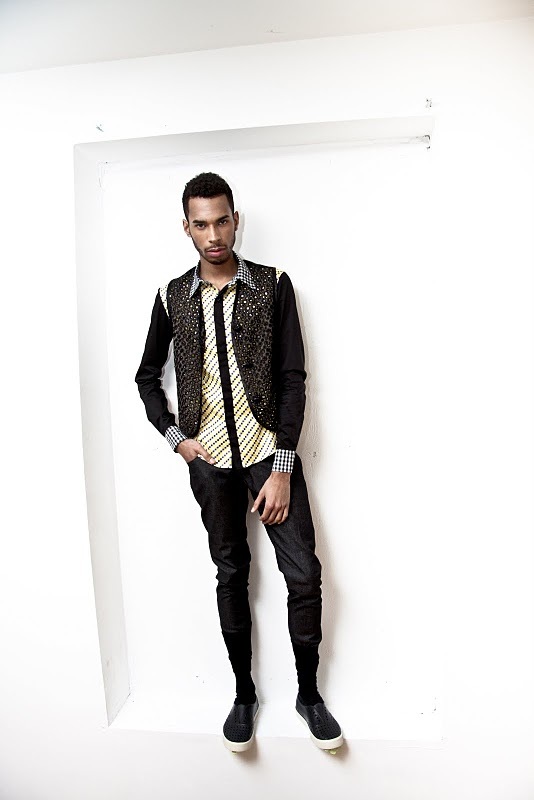 I am Nigerian-Canadian designer from Toronto and the name of my label is Chinedesign. How did you get into designing and when did you start Chinedesign? I used to record and perform music around Toronto as Eye + Eye. I designed some t-shirts for my crew to wear while promoting my "Love.Life.Music". People get asking us when the shirt would be for sale so I started producing them. When I got bored of just doing only graphic t's, I started learning how to design other garments. That in a nutshell is the story of Chinedesign. How would you describe the chinedesign signature ? Still too early to tell. At this point I am just trying my hand at everything that excites me. Maybe in a few more years, I can look back and find a common thread running through the different collections. When you designed this collection what type of woman did you think about ? To be honest, I was not thinking of a particular type of woman. I knew the different facets and periods of African culture that I wanted to explore with the Afrotropolis collection and that was where the design inspiration come from. Now that collection is finished, I think it is quite versatile. I had people fill out a wishlist at my recent presentation and no piece was hugely favoured more than the other so I think the collection is well balanced even though that was not done intentionally. The Ndebele-patterened silk dresses are quite bold and colourful for instance while the sheer black Empress trenchcoat is more understated and simple. They might appeal to two different types of women or they could be worn by the same woman at the same time. 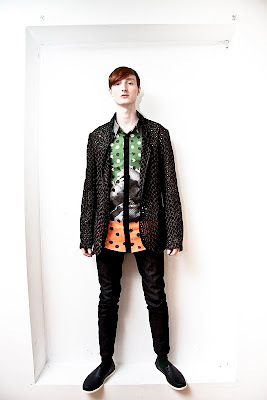 What do you think about the rise of African designers in the western world. As Africa keeps on inspiring the fashion world, It's a beautiful thing to see actual African designers also making some headway. I'm still waiting for one or more of us to break into the mainstream in a major way. Wouldn't it be great to walk into a luxury department store and see an African designer's line merchandised right next to a Stella McCartney or Alexander McQueen? Or to see an African designer set up a flagship on a major fashion thoroughfare. What type of experiences ,trends, and or themes inspired your latest collection ? Africa was on mind. I wanted to take inspiration from around the continent and incorporate it into a modern collection without relying too much on the obvious. It had to look modern but with an African foundation. I was inspired from everything from Ndebele wall art and ancient Kente cloth to nomadic African "cowboys" to the optimism of post-independence 60s and ancient Benin Art. You don't have to look hard to find all these things referenced in the Afrotropolis collection. Who is your favorite designer of all time ? if you had to dress one Nollywood star who will it be ? Genevieve Nnaji without a doubt. I think her beauty is timeless. Alot of stars have come and gone but she still has the "it" factor. What do you which to accomplish within the next coming years ? I'm gonna be busy with a travelling pop-up shop/gallery called SUPAFRIK. I will sell my collections through it and also feature the works of other designers and artists that share an African inspiration. We will launch it in Toronto this summer and then move on to London and Paris. I would also like to publish my collection of short stories and start producing some of my collection in Africa. Through twitter or the Chinedesign facebook group. I try my best to respond to all inquires. What is your price range and when will the new collection be available for purchase ? I have t-shirts that start at $35 and some garments that go up to about $300. The collection will be available in select boutiques in Toronto and also at the SUPAFRIK pop-up that I'm launching July 15th in Kensington Market, Toronto. Hopefully we can also get it on a few online stores for people that do not live in Toronto. Who is your favorite celeb style and why ? I should start watching celebrities a little closer because I am never good at answering this question...lol...I have noticed that Rihana seems to look good in almost everything she wears (minus that outfit in the "All of the lights" video...hahaha). Some of the best style I have seen has been on the streets and not in a glossy magazine and that's why I follow styleblogs such as "The Sartorialist". Perhaps your readers can suggest stylish celebrities for me to check out. What's a must have in fashion at the moment ? A floral print tote or clutch for women and for men tailor made button up shirts. Also everybody "must have" a good tailor for alterations. An ill-fitting expensive garment can look cheap. A well-fitted cheap garment can look expensive. Thanks for the interview. I am a big fan of your blog and I am glad I got a chance to connect with you and your readers. Great interview! Nigerians all over the world doing great things!